Mother Conference is a one-day educational event for new mums and mums to be. 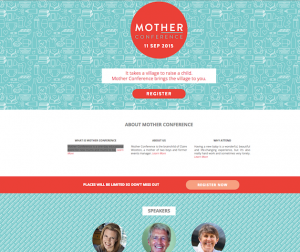 Claire Wootton, the organiser and promoter of Mother Conference needed a simple landing page to promote her event, take registrations and sell tickets online. She had a very limited budget to promote the inaugural event but wanted the site to appeal to new mums. Claire had worked with a designer to create a logo and some key images. We took those designs, worked with Claire to understand what content she needed on the site and then created a landing page for her.